Image: Wizards of the Coast. “Injury” by Lucas Graciano. 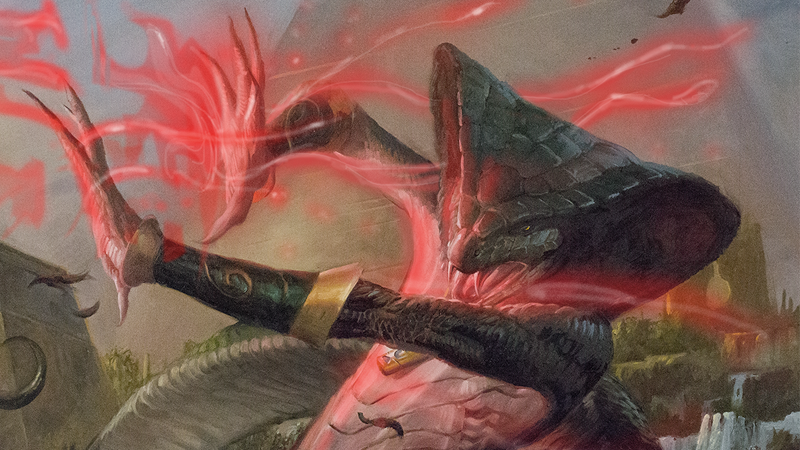 The next addition to the realms of Magic: The Gathering is taking players to the desert oasis of Amonkhet, a magical land that’s essentially Magic’s own take on the mysticism of Ancient Egypt. Ahead of the 74th expansion’s arrival in stores later this month, io9 is proud to debut a few of the new cards and the art behind this new plane of mystery. An entirely new setting within Magic’s vast lore, Amonkhet is a sand-strewn land ruled by the planeswalker Nicol Bolas, one of the most powerful magic users in Magic’s vast pantheon of elemental planes. A world driven by quests for worthiness, Amonkhet is a land that forges hardy warriors who look to enter the Trials of the Five Gods, a series of trials where victory grants you death, and supposedly a cushy place in the afterlife, courtesy of Bolas himself. Check out three new “split cards”—special cards that have two different sets of characteristics depending on whether the card is in play or in your stack of discarded cards—from the 269-card set below, making their debut here on io9. As well as the actual expansion set, Amonkhet will also release an accompanying art book, helpfully titled The Art of Magic: The Gathering–Amonkhet, filled with artwork from the card set as well as information about the lore of the Amonkhet plane. You can check out a spread from the art book below, also making its debut here on io9, as well as higher-resolution versions of the art for both those pages and the above Amonkhet cards. Don’t forget to click the magnifying glass in the top left of each image to enlarge each one, and then open them in new tabs to see their full resolution! Amonkhet, the 74th expansion set for Magic: The Gathering, will release on April 28. The Art of Magic: The Gathering—Amonkhet will release in July.